Although marketed as quick cash for financial emergencies, payday and car-title loans typically become long-term debt that drains hundreds of dollars—if not thousands—from consumers. These small dollar loans carry average annual percentage rates of 391% that make it very difficult to escape a cycle of debt that can last months or years. Either through direct access to borrower bank accounts or threats to repossess a borrower’s car, lenders gain extreme leverage over borrowers who come to later understand how unaffordable the loans really are. Besides owing more money for fees than for the loan itself, borrowers also experience other financial harms including delinquency on other bills, overdraft, NSF charges, and involuntary loss of bank accounts. 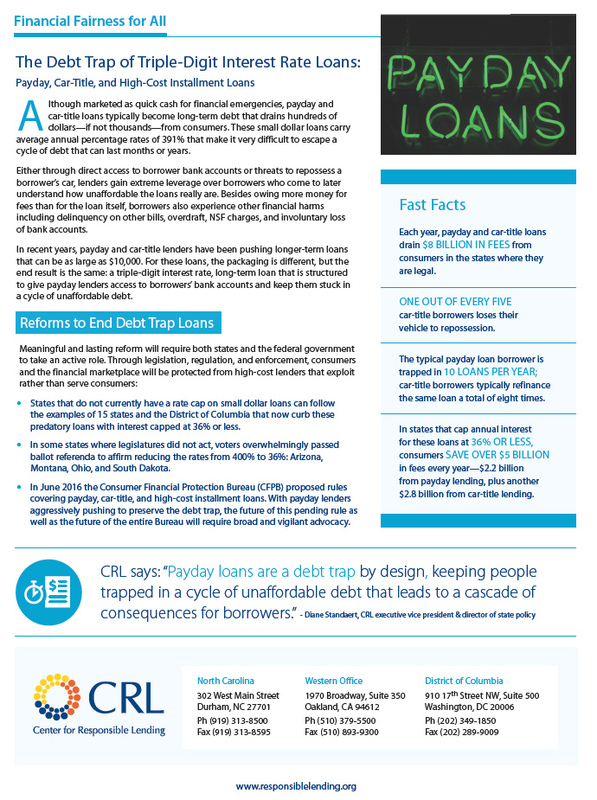 Download the payday lending factsheet.